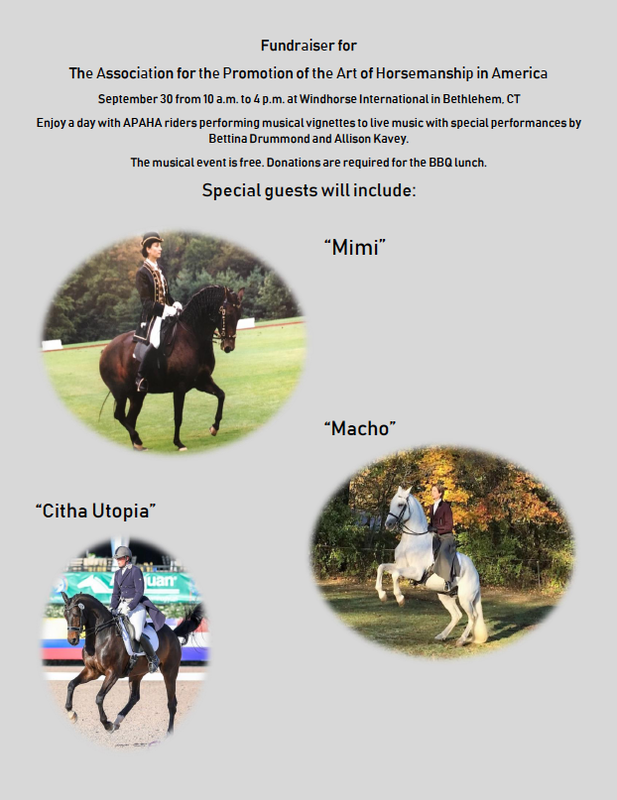 Come enjoy an afternoon of entertainment with Bettina Drummond performing to music by a live quartet on her spectacular mare Granada Du Plessis (Mimi) and the stallion Que Macho. The afternoon includes a series of musical vignettes ridden by some of Bettina's students and a Barbecue luncheon. Reservations suggested. see www.apaha.us to sign up. Please bring a chair if you haven’t let us know in advance that you are coming. It will be a day of exciting events that kicks off at 10 a.m. with a demonstration by Bettina Drummond and Macho on use of the La Guérinière square as they ride to live music. 10:15 a.m.: Lynndee Kemmet with Je Suis and Carol Ley with Sonrisa will demonstrate the use of the square while riding to music as a method for strengthening green horses. 10:45 a.m.: Amanda Timolat with Ella and Elizabeth David with Amado will demonstrate use of the square in relaxation and maintaining cadence in the lateral work and the use of half-halt in the corners of the square. 11:30 a.m.: Kris Jennette and Errol and Kathleen Reineck and Goldmein will demonstrate the development of passage and piaffe in the square. 12:00 p.m.: Allison Kavey and Cacharel demonstrate the use of the square during an improv to live music. 12:30 p.m.: Bettina Drummond and Mimi present a musical improv. 2:00 p.m: Bettina Drummond and Macho present a musical demonstration. 2:30 p.m.: Allison Kavey and Utopia present a musical keur.